With the dearth of secondhand bookshops I often find myself drawn to remaindered shops. As is often the case when visiting Sandpiper in Brighton’s North Laines I discovered a lovely book in the back room £1 section. 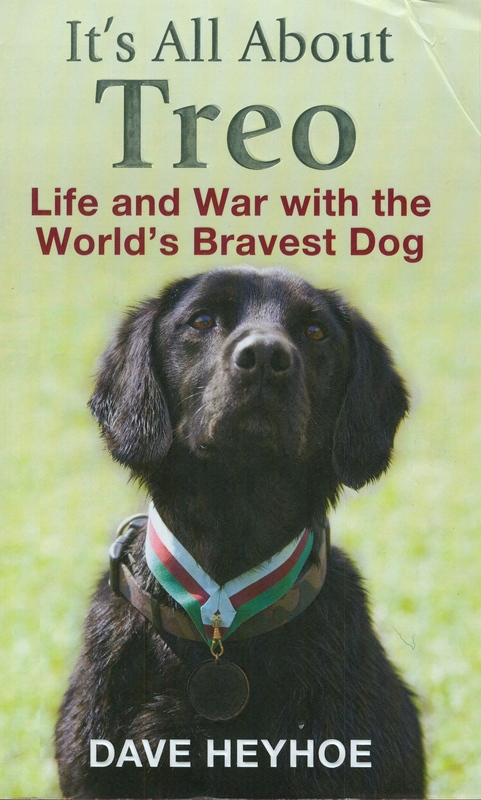 This fascinating read explores the relationship between Dave Heyhoe and his sniffer dog Treo and the role that this relationship played in detecting unexploded bombs in Afghanistan. The same features of training initiated by Colonel Edwin Richardson during the 1914 -18 war are present today. Richardson believed that working with animals required a special gift in the instructor, particularly choosing men who were fond of dogs and thus who would be able to relate productively towards dogs. The building of a relationship was key. Dogs needed to be trained. More importantly so did handlers working with them. 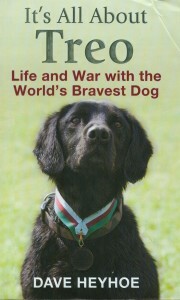 Significantly Richardson’s book on the topic emphasised understanding rather than control as seen in its title: British War Dogs, Their Training and Psychology. So effective was his approach that it was also used in the 1939 – 45 war and beyond. Dave Heyhoe clearly experienced similar approaches in training to those advocated by Richardson. By way of contrast Heyhoe noted that US dogs were routinely kept on a leash since they were trained to both find arms and explosives but also to chase, bring down and hold a suspect. British training differentiated between the two tasks with dogs being encouraged to follow their own nose and intuition being off lead while searching for IEDs. That way Treo was “free to achieve his best”. While some of the book is, unsurprisingly, anthropomorphic in tone it is interesting that the British soldiers and Taliban alike seemed to acknowledge the specific canine skills of Treo. The dog was feared (or respected) because of his own capacities and skills. As a former Royal Air Force Police Dog handler of 9 years experience both in the security role and in tracking (sniffer) terrorists after bomb attacks, it should not be forgotten that the RAF has been a leader in police dog training and has been instrumental in giving advice and practical training methods for HM customs and excise dogs in the UK and many police forces throughout the world. The methods used by the RAF Police dog sections are second to none and their handlers are some of the best in the world. Kindness with firmness and a love of their charges puts the RAF Police dog teams leaders in their field. It is said by all handlers that you can take the man out of the dog but not the dog out of the man. Talk to any former RAFP QPD (qualified police dog handler) years after he has left the service and you will discover he can be as enthusiastic and eager to give advice when asked with passion and will share his many experiences and will sometimes be unbelievable in their content.